Your shoulders are constructed as a ball and socket joint, and is one of the most unstable joints in the body but it is also the joint with the largest range of motion. 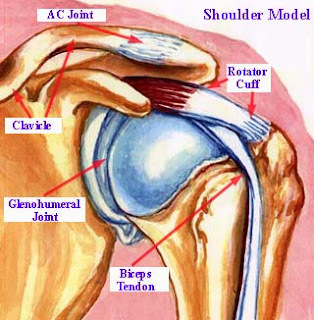 The shoulder socket is called a glenoid, while the ball of the joint is actually the head of the humerus, your upper arm bone. The acromion sits on top of the ball and socket, next to AC Joint, which is the most common place for shoulder separations. Your shoulders has a significant Range of motion but this also opens you up to a catastrophic injury so be careful!! Before I get to the best shoulder exercises to build muscle, I think you should know more about the functions of the shoulder which will prevent you from injuring yourself down the road. The shoulders are triangular in shape and have 3 distinct heads Anterior, Medial and Posterior Deltoid. The front head of the shoulder flexes and rotates the arm inward. The anterior delts play a major role in bench pressing, other chest training, and usually get stimulated from triceps and biceps training. This is typically one of the most overdeveloped muscles for traditional weight lifters, which often develops into a muscular imbalance that can lead to injury and posture problems. The side head of the shoulder abducts the arm, which means it brings the arms out and away from the midline of the body. This muscle is activated more by isolated shoulder abduction movements, such as dumbbell side raises, than by anything else. The rear head of the shoulder extends and rotates the arm outward. Back training such as rows, chin ups, and pull ups involve the rear delts more than most other exercises. 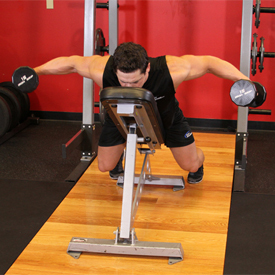 Reverse flyes are considered an isolation movement for the rear delts. Sit on a bench with back support in a squat rack. 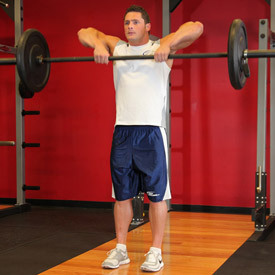 Position a barbell at a height that is just above your head. Grab the barbell with a pronated grip (palms facing forward). 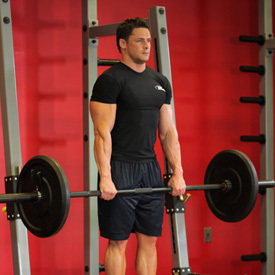 Once you pick up the barbell with the correct grip width, lift the bar up over your head by locking your arms. Hold at about shoulder level and slightly in front of your head. This is your starting position. This exercise can also be performed standing. 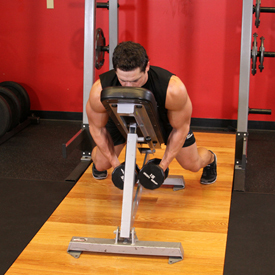 Variations: You can perform the exercise standing or sitting on a regular flat bench. For people with lower back problems, the version described is the recommended one. Grasp a barbell with an overhand grip that is slightly less than shoulder width. The bar should be resting on the top of your thighs with your arms extended and a slight bend in your elbows. Your back should also be straight. This will be your starting position. Now exhale and use the sides of your shoulders to lift the bar, raising your elbows up and to the side. 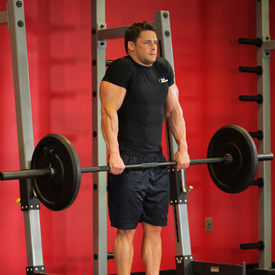 Keep the bar close to your body as you raise it. Continue to lift the bar until it nearly touches your chin. Tip: Your elbows should drive the motion, and should always be higher than your forearms. Remember to keep your torso stationary and pause for a second at the top of the movement. Variations: This exercise can also be performed using a straight bar attached to a low pulley and it can also be performed using dumbbells, though this later exercise should be reserved by people that are well familiarized with correct execution. While holding a dumbbell in each hand, lay with your chest down on a slightly inclined (around 15 degrees when measured from the floor) adjustable bench. Position the palms of the hands in a neutral manner (palms facing your torso) as you keep the arms extended with the elbows slightly bent. This will be your starting position. Now raise the arms to the side until your elbows are at shoulder height and your arms are roughly parallel to the floor as you exhale. Tip: Maintain your arms perpendicular to the torso while keeping them extended throughout the movement. Also, keep the contraction at the top for a second. Slowly lower the dumbbells to the starting position as you inhale. 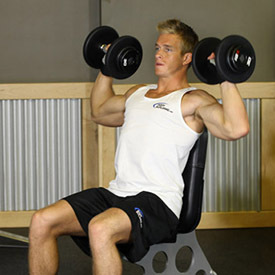 Repeat for the recommended amount of repetitions and then switch to the other arm. Variations: You can perform this exercise with just one arm and also keeping the palms of the hands facing back as opposed to facing your torso. 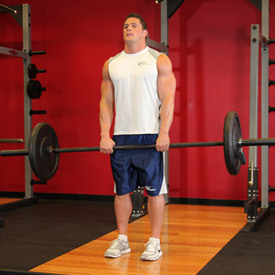 Stand up straight with your feet at shoulder width as you hold a barbell with both hands in front of you using a pronated grip (palms facing the thighs). Tip: Your hands should be a little wider than shoulder width apart. You can use wrist wraps for this exercise for a better grip. This will be your starting position. Raise your shoulders up as far as you can go as you breathe out and hold the contraction for a second. 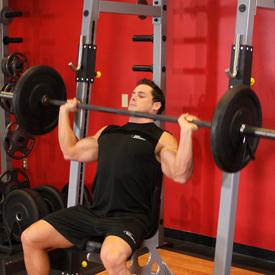 Tip: Refrain from trying to lift the barbell by using your biceps. Variations: You can also rotate your shoulders as you go up, going in a semicircular motion from front to rear. However this version is not good for people with shoulder problems. 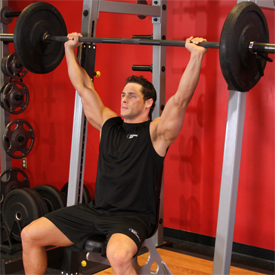 In addition, this exercise can be performed with the barbell behind the back, with dumbbells by the side, a smith machine or with a shrug machine. Pick a couple of dumbbells and sit at the end of a flat bench with your feet firmly on the floor. 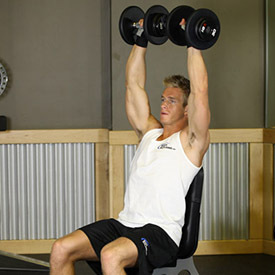 Hold the dumbbells with your palms facing in and your arms straight down at your sides at arms' length. This will be your starting position. While maintaining the torso stationary (no swinging), lift the dumbbells to your side with a slight bend on the elbow and the hands slightly tilted forward as if pouring water in a glass. Continue to go up until you arms are parallel to the floor. Exhale as you execute this movement and pause for a second at the top. Variations: This exercise can also be performed standing up.